The new UK funding, announced as she arrives in Washington D.C. for the World Bank Spring Meetings today (Thursday 11 April), includes £10 million of humanitarian aid, including food, water and sanitation facilities. Further funding of up to £4 million will provide emergency education to children caught up in the disaster. 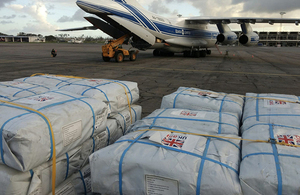 The UK and US remain the biggest donors to the cyclone response. At the World Bank Meetings today Ms Mordaunt will co-host a to discuss the response to Cyclone Idai and encourage other donors to increase their funding. She will also stress the need to help African countries become more resilient to climate change. We have all seen images of the terrible suffering and devastation caused by Cyclone Idai. The UK has, from the start, led the way in supporting the victims of this destruction and the fresh funding I am announcing will provide further help where it is most needed, right now. But we must plan for the future too. Over the next century increasing temperatures are likely to make severe weather events across Africa more frequent. The UK is already leading the way in helping African communities adapt to climate shocks, providing technical expertise and finance. However, climate change is a global issue which requires global action. We must act now, so worldwide we are better prepared to deal with future extreme weather events. If we don’t the consequences could be devastating. African nations are responsible for just 2 to 3% of global emissions, but Africa is set to be the continent worst impacted by climate change, hit by changing season patterns that damage crops and natural disasters that threaten communities. increase the use of disaster risk financing, so countries can more easily access funding following a disaster. As well as funding the immediate cyclone relief effort across the region, the UK has already committed to spend £5.8 billion to help developing countries respond to the challenges of climate change up to 2021. This includes making agriculture more resilient to climate shocks and improving access to clean energy. Water and Sanitation facilities - to contain disease outbreaks and contain levels of acute malnutrition. Food security and nutrition – this will particularly support areas that depend on agriculture. Infrastructure – to help increase access to the worst affected areas. Today’s funding also includes up to £4 million towards Education Cannot Wait, the UNICEF hosted global fund for education in emergencies and protracted crises. Thousands of classrooms in Mozambique, Zimbabwe and Malawi were destroyed by Cyclone Idai, affecting the education of hundreds of thousands of children. The UK’s support following Cyclone Idai includes matching £4 million in public donations to the Disasters Emergency Committee (DEC) appeal. The DEC Appeal has raised £29 million. This includes £25 million of donations from the British public and £4 million of UK Aid Match funding. UK aid has already provided temporary accommodation for around 50,000 people affected by the cyclone, as well as cash support and food supplies to feed around 700,000 people. It has also sent purification cubes, blankets and solar lanterns to the region and provided chartered planes and equipment to help distribute supplies. A team of British health workers is in the region to help deal with the growing threat of disease following the disaster. They are working alongside the World Health Organisation in Mozambique, to assess the risk of cholera.